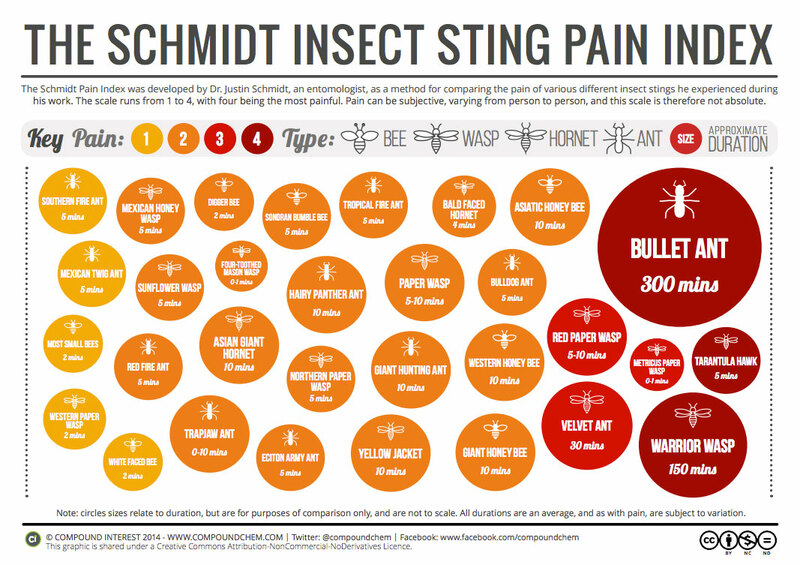 Note: The European Hornet is not displayed in the chart above (See 2.x in Pain Index Samples below). 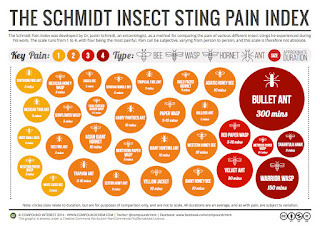 The Schmidt Sting Pain Index is a pain scale rating the relative pain caused by different hymenopteran stings. It is mainly the work of Justin O. Schmidt (born 1947), an entomologist at the Carl Hayden Bee Research Center in Arizona. Schmidt has published a number of papers on the subject, and claims to have been stung by the majority of stinging Hymenoptera. Hymenoptera is the third-largest order of insects, including sawflies, wasps, bees, and ants. Keep in mind the duration of the pain, mix of other toxins in the venom, the potency and toxicity of the venom, the necrotic and hemorrhagic properties of the venom, the aggressiveness of the insect, and their propensity to swarm are factors that can also affect the severity of a sting or stings. In other words, pain is not necessarily directly correlated with potency of venom. 1.2 Fire ant: Sharp, sudden, mildly alarming. Like walking across a shag carpet and getting a static spark while reaching for the light switch. 2.x Honey bee and European hornet (EH), Asian Giant Hornet (AGH) [Our note: Asian Giant Hornets and European Hornets have chemicals in their venom that can cause atrial fibrillation (EH) and ulcer wounds (AGH) the size of bullet holes, toxic hepatitis (AGH) and toxic myocarditis (AGH)]. 4.0 Pepsis wasp, also Tarantula Hawk: Blinding, fierce, shockingly electric. "A running hair drier has been dropped into your bubble bath" (if you get stung by one you might as well lie down and scream, but at least you won't be electrocuted and killed like as the case of the hair drier in the bubble bath tragedy). In this episode of Breaking Trail (below), Coyote Peterson gets stung by a terrifying Tarantula Hawk, On this episode of Breaking Trail, Coyote gets stung by a terrifying Tarantula Hawk, Pepsis grossa.